Neurogenesis occurs at different stages of mammalian development. Central nervous system (CNS) development begins with the induction of the neuroectoderm to form the neural plate and then the neural tube. The caudal region of the neural tube gives rise to the spinal cord and the rostral region becomes the brain. During these early stages of neural development, cells divide rapidly. Immature neurons migrate from zones of cell proliferation to their final positions and start to extend neurites to form contacts with other cells. After prenatal development, neurogenesis is limited and restricted to the subventricular zone in the lateral wall of the lateral ventricle, and the subgranular zone of the dentate gyrus of the adult mammalian brain. There, neural stem cells continuously generate new neurons throughout life. The CNS includes two main classes of cells: neurons and glial cells. Neurons receive, process, and transmit information, while glial cells support and protect neurons by maintaining homeostasis, forming myelin, supplying nutrients, destroying pathogens, and removing dead neurons, among other functions. In vertebrates, glial cells outnumber neurons 10–50 times, and are divided into microglia and macroglia. The two major classes of macroglia in the CNS are astrocytes and oligodendrocytes. Neurogenesis persists in two regions of the mammalian adult brain: the subventricular zone in the lateral wall of the lateral ventricle and in the subgranular zone of the dentate gyrus. Adult neural stem cells (NSCs) in these regions have the capacity to self-renew and generate new neurons throughout life. NSCs are a subset of astrocytes and thus, express characteristic astrocyte markers like GLAST and GFAP. The mammalian brain contains between 100 million and 100 billion neurons, depending on the species. Neurons are electrically excitable cells that transmit information through action potentials and neurotransmitters to other neurons or other cell types. Depending on the neurotransmitter and receptors on the receiving cell, the signal may be excitatory or inhibitory. Neurons exhibit extensive morphological and physiological heterogeneity and lack a specific pan cell surface marker, such that pan neuronal cells can only be identified and isolated indirectly by labeling non-neuronal cells. Astrocytes are the most abundant cell type of the CNS, and exhibit broad morphological and functional heterogeneity. Astrocytes regulate ion and glutamate homeostasis, control the number and function of synapses, contribute to wound healing, form the blood–brain-barrier, and modulate cerebral blood flow. Astroglial cells also act as adult neural stem cells in the subventricular zone of the lateral ventricle’s lateral wall and in the subgranular layer of the dentate gyrus. GLAST is the most abundant glutamate transporter and a specific astrocyte marker in the developing and neonatal mammalian CNS. Radial glia and stem cells also express GLAST. The ACSA-2 antigen is specifically expressed on GLAST (ACSA-1)-positive astrocytes and is a second astrocyte-specific surface marker (PMID: 28317180). The antigen targeted by Anti-ACSA-2 is ATP1B2 (PMID: 28373281). Oligodendrocytes form the myelin sheath around neuronal axons that facilitates the fast saltatory propagation of action potentials. Several distinct phenotypic developmental stages of oligodendrocytes have been identified, both in vivo and in vitro, based on the expression of specific markers, since morphological criteria alone are often insufficient to characterize each stage. Oligodendrocyte precursor cells (OPCs) are small, round, process-bearing cells with active proliferation and migratory properties. They are identified in vitro with the A2B5 antibody that recognizes several gangliosides. However, this antibody also labels other cell types in vivo, so more specific makers are used, such as the transmembrane receptor tyrosine kinase PDGFRα (platelet-derived growth factor receptor alpha), and the single membrane-spanning chondroitin sulphate proteoglycan NG2 (AN2). These are the most reliable markers for OPCs in vivo and are also used to label adult OPCs (PMID: 18931697). When OPCs begin to differentiate, they express a sulfated surface antigen known as POA (pro-oligodendroblast antigen), which is recognized by the antibody O4. During oligodendrocyte development, O4 expression begins on late oligodendrocyte progenitors that are A2B5-positive. While A2B5 expression disappears, O4 continues to be expressed. As the cells differentiate, they synthesize galactocerebroside, myelin basic protein (MBP), proteolipid protein (PLP), myelin oligodendrocyte glycoprotein (MOG), and O1. Microglia (brain macrophages) are the resident immune effector cells of the CNS. Activated microglia also serve as antigen-presenting cells. They are morphologically, immunophenotypically, and functionally related to cells of the monocyte/macrophage lineage and characterized by expression of CD11b in humans and mice or CD11b/c in rat, CD68, F4/80, and MHC class II. Miltenyi Biotec has created dedicated applications to isolate, cultivate and characterize different neural cell types. A special protocol describing immunofluorescence staining with neural cell antibodies for microscopy, as well as tutorial videos for the isolation of viable astrocytes and microglia can be accessed in the Related Resources Panel to the right. Neural cell samples can be obtained from whole brains, a brain region, or the spinal cord. Downstream applications to characterize neural cells may require upfront sample preparation, such as tissue dissociation to generate single-cell suspensions. For details, see Chapter mouse brain. Miltenyi Biotech has developed numerous products for the isolation of distinct neural cell types from single-cell suspensions. Most kits are based on the positive selection of magnetically labeled target cells, but isolation of neurons is done by depleting non-target cells. For details on MACS® Cell Separation Technology, see the MACS Handbook chapter Magnetic Cell Separation . The ability to study neurons in a controlled environment and under specific conditions is necessary to understand cellular and molecular mechanisms during CNS development and in diseases. Existing techniques for isolation and cultivation of neurons have shortcomings. Cell culture with anti-mitotic agents (e.g., AraC) can lead to glial cell contamination, is time-consuming and does not allow analysis of freshly isolated cells. Flow cytometry sorting is relatively fast, but requires transgenic mice and cells undergo pressure that causes reduced viability. Miltenyi’s Neuron Isolation Kit, mouse is the only commercially available product for neuron isolation from both wild type and transgenic mouse. Based on depletion of non-neuronal cells labeled with novel non-neuronal cell markers, the kit achieves purities of 97% for animal age ≤P7 and 93% for animal age >P7. The isolated neurons are ready for downstream applications, like cell culture, cellular and molecular analysis, and functional assays. Adult neurons are especially fragile, making primary adult neuron isolation and culture challenging. Currently, isolation and culture are generally limited to embryonic tissues (ca. E16–18), when glial cells are less abundant, or early postnatal stages before formation of synapses. However, embryonic neurons behave differently from adult neurons in terms of pharmacology, electrophysiology, development, and regenerative and pathological characteristics. The Neuron Isolation Kit, mouse combined with the Adult Brain Dissociation Kit, mouse and rat and the gentleMACS™ Octo with Heaters, allows isolation of highly purified viable neurons from adult mouse brain in half a day. To assess and further boost purity of isolated neurons, Miltenyi Biotec offers a wide range of antibodies specific to non-neuronal cell surface markers to exclude contamination by glial cells, such as astrocytes, microglia, and oligodendrocytes. Depletion of non-target cells to isolate neurons. With the Neuron Isolation Kit, mouse, unwanted cells in a single-cell suspension are magnetically labeled and depleted. The non-labeled, untouched cell fraction containing the target neurons can then freely flow through the column. With the Neuron Isolation Kit, mouse, unwanted cells in a single-cell suspension are magnetically labeled and depleted. The non-labeled, untouched cell fraction containing the target neurons can then freely flow through the column. Efficient isolation of neurons from neonatal and adult mouse brains. Neurons were isolated from brain tissue of P2 (top) and 9-week-old CD-1+ mice (bottom). P2 mouse brain was dissociated using the Neural Tissue Dissociation Kit – Postnatal Neurons, and adult mouse brain using the Adult Brain Dissociation Kit, mouse and rat. Neurons were isolated using the Neuron Isolation Kit, mouse, LS Columns, and a MidiMACS™ Separator. Cells were fluorescently stained with an antibody cocktail specific for non-neuronal cells and the astrocyte-specific antibody Anti-ACSA-2-PE, the oligodendrocyte-specific antibody Anti-O4-PE, and the microglia-specific antibody CD11b-FITC. Cells were then analyzed by flow cytometry on the MACSQuant® Analyzer 10. Cell debris and dead cells were excluded from the analysis based on scatter signals and propidium iodide fluorescence. Efficient isolation of neurons from neonatal and adult mouse brains. Neurons were isolated from brain tissue of P2 CD-1+ mice. P2 mouse brain was dissociated using the Neural Tissue Dissociation Kit – Postnatal Neurons. Neurons were isolated using the Neuron Isolation Kit, mouse, LS Columns, and a MidiMACS™ Separator. Cells were fluorescently stained with an antibody cocktail specific for non-neuronal cells and the astrocyte-specific antibody Anti-ACSA-2-PE, the oligodendrocyte-specific antibody Anti-O4-PE, and the microglia-specific antibody CD11b-FITC. 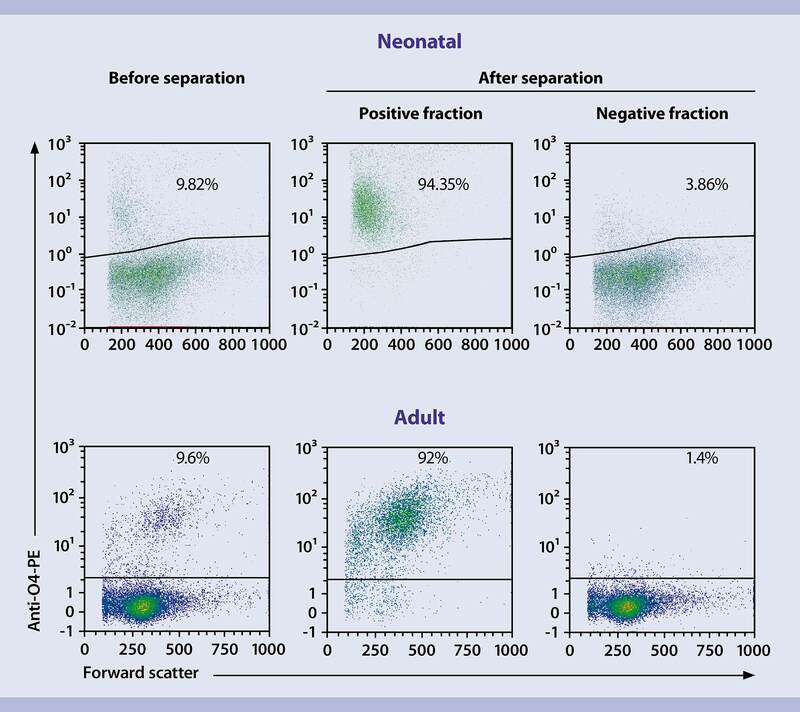 Cells were then analyzed by flow cytometry on the MACSQuant® Analyzer 10. Cell debris and dead cells were excluded from the analysis based on scatter signals and propidium iodide fluorescence. Efficient isolation of neurons from adult mouse brains. Neurons were isolated from brain tissue of 9-week-old CD-1+ mice. Adult mouse brain was dissociated using the Adult Brain Dissociation Kit, mouse and rat. Neurons were isolated using the Neuron Isolation Kit, mouse, LS Columns, and a MidiMACS™ Separator. Cells were fluorescently stained with an antibody cocktail specific for non-neuronal cells and the astrocyte-specific antibody Anti-ACSA-2-PE, the oligodendrocyte-specific antibody Anti-O4-PE, and the microglia-specific antibody CD11b-FITC. Cells were then analyzed by flow cytometry on the MACSQuant® Analyzer 10. Cell debris and dead cells were excluded from the analysis based on scatter signals and propidium iodide fluorescence. The CD171 (L1CAM, L1 cell adhesion molecule) antibody and CD171 (L1CAM) MicroBead Kit were developed to detect and isolate L1CAM-positive neurons, such as Purkinje neurons in the cerebellum, from dissociated mouse brain tissue derived from mice younger than eight days (<P8). Neuron isolation based on positive selection of CD171. P7 mouse cerebelli were dissociated using the Neural Tissue Dissociation Kit (T). Subsequently, neurons were isolated using the CD171 (L1CAM) MicroBead Kit. Cells were fluorescently stained with Labeling Check Reagent-APC and analyzed by flow cytometry on the MACSQuant Analyzer. Cell debris and dead cells were excluded from the analysis based on scatter signals and propidium iodide fluorescence. Successful cultivation of CD171(L1CAM)+ cells. Cells were cultured in MACS Neuro Medium, MACS NeuroBrew-21, 1%P/S and 0.5mM L-glutamine on PLL-coated glass coverslips (1x105 cells per well of a 24-well plate). After 5 days in culture, cells were fixed and stained with the neuron-specific antibodies Anti-MAP2 (red) and Anti-TuJ1 (green). Successful cultivation of CD171(L1CAM)+ cells. Cells were cultured in MACS Neuro Medium, MACS NeuroBrew-21, 1%P/S and 0.5mM L-glutamine on PLL-coated glass coverslips (1x105 cells per well of a 24-well plate). After 5 days in culture, cells were fixed and stained with the neuron-specific antibodies Anti-MAP2 (red) and Anti-TuJ1 (green). Highly purified viable astrocytes from neonatal and adult mouse brain can be acquired by positive selection using the astrocyte-specific cell surface markers GLAST or ACSA-2 (astrocyte cell surface antigen-2). Both antibodies (Anti-GLAST (ACSA-1) and Anti-ACSA-2) can be used for flow cytometry analysis, and immunocytochemistry or immunohistochemistry analysis. The Anti-GLAST (ACSA-1) antibody was the first monoclonal antibody developed by Miltenyi Biotec, and detects the extracellular epitope of the glutamate transporter GLAST (EAAT1). This antibody was generated by immunization of GLAST1 knockout mice with GLAST-expressing 1881 cells. The anti-GLAST antibody labels all GFAP, GS, BLBP-positive astrocytes, reactive astrocytes, radial glia, Müller glia, and Bergmann glia, and shows superior performance in astrocytes detection and separation (PMID: 22374709). The Anti-ACSA-2 antibody is a novel monoclonal antibody generated by immunizing rats with astrocytes isolated from GFAP-EGFP transgenic mice. Immunohistochemical and flow cytometry analyses demonstrate the high specificity of Anti-ACSA-2 for astrocyte lineage cells (PMID: 28317180). The ACSA-2 epitope was identified recently as ATP1B2 and the authors recommend the anti-ACSA-2 antibody as “a first-choice method for astrocyte isolation and characterization.” (PMID: 28373281). Unlike GLAST, the ACSA-2 epitope is papain-resistant. Thus, it can be used for astrocyte separation and analysis after papain-based tissue dissociation, as well as for astrocyte isolation from adult mouse brain. Isolation of neonatal astrocytes. Single-cell suspensions from P3 mouse brain tissues were prepared using the Neural Tissue Dissociation Kit (T) (A) or Neural Tissue Dissociation Kit (P) (B). 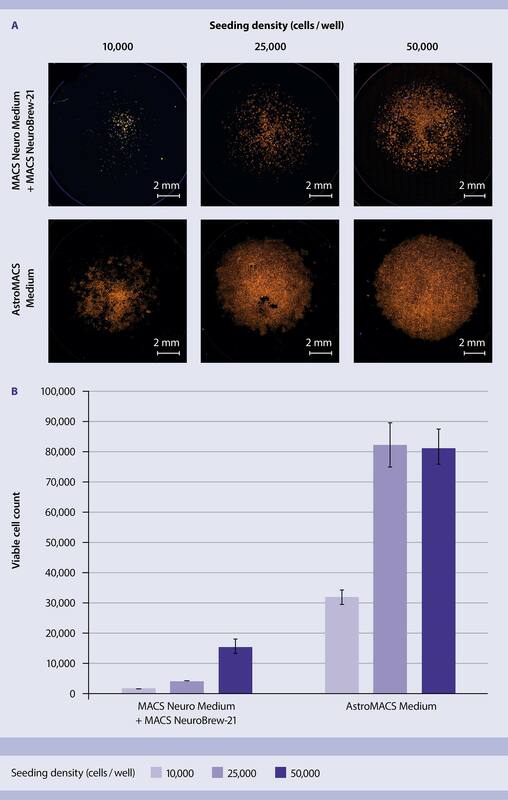 Neonatal astrocytes were isolated from the single-cell suspensions using the Anti-GLAST (ACSA-1) MicroBead Kit, human, mouse, rat (A), or the Anti-ACSA-2 MicroBead Kit, mouse (B). 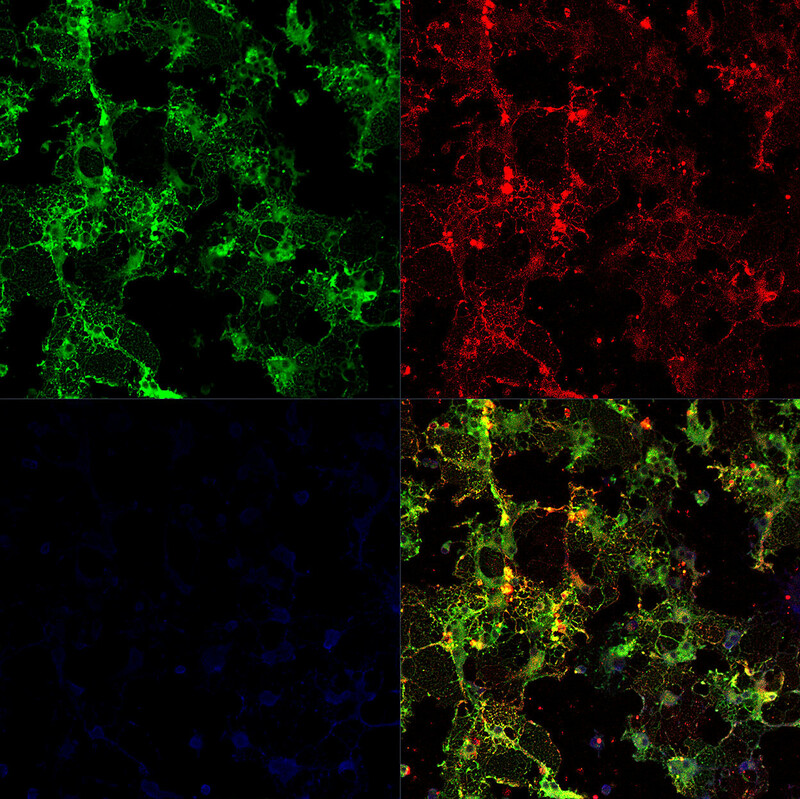 Cells were fluorescently stained with Anti-GLAST antibodies (A), or Anti-ACSA-2 antibodies (B) and analyzed with the MACSQuant Analyzer. Single-cell suspensions from P3 mouse brain tissues were prepared using the Neural Tissue Dissociation Kit (T) (A) or Neural Tissue Dissociation Kit (P) (B). 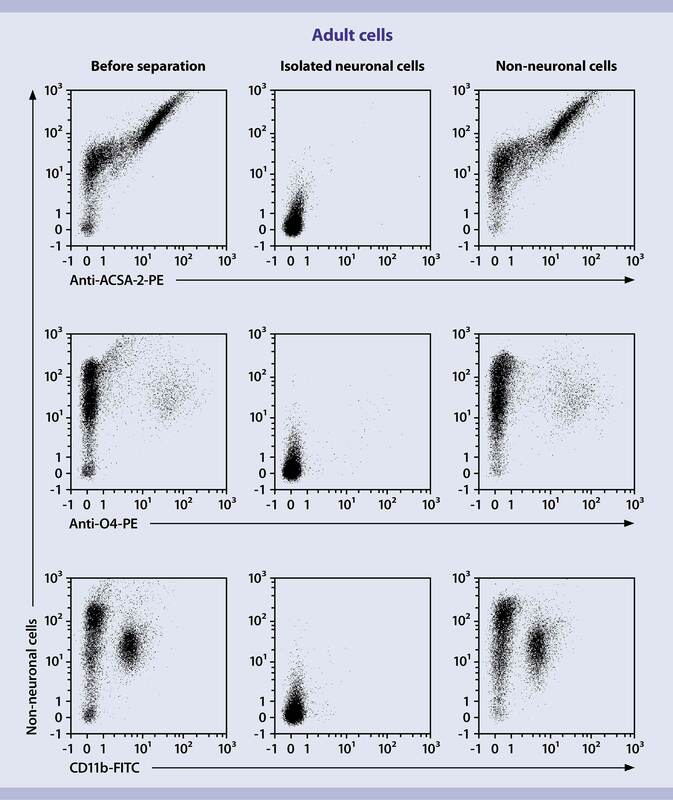 Neonatal astrocytes were isolated from the single-cell suspensions using the Anti-GLAST (ACSA-1) MicroBead Kit, human, mouse, rat (A), or the Anti-ACSA-2 MicroBead Kit, mouse (B). 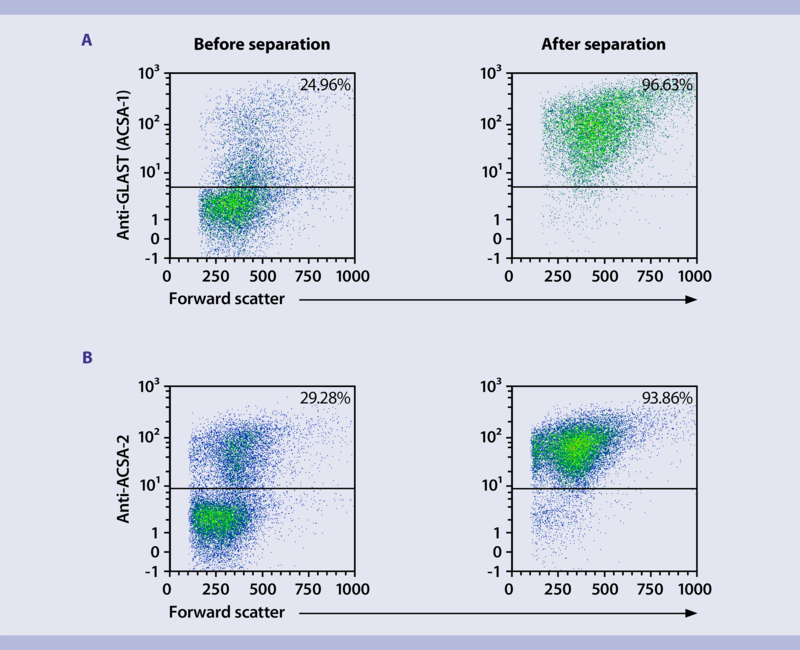 Cells were fluorescently stained with Anti-GLAST antibodies (A), or Anti-ACSA-2 antibodies (B) and analyzed with the MACSQuant Analyzer. Isolation of adult astrocytes. A single-cell suspension from 3-month-old mouse brain was prepared using the Adult Brain Dissociation Kit, mouse and rat. Adult astrocytes were isolated from the single-cell suspension with the Anti-ACSA-2 MicroBead Kit, mouse. Cells were fluorescently stained with the Anti-ACSA-2 antibody and analyzed by flow cytometry on the MACSQuant Analyzer. A single-cell suspension from 3-month-old mouse brain was prepared using the Adult Brain Dissociation Kit, mouse and rat. Adult astrocytes were isolated from the single-cell suspension with the Anti-ACSA-2 MicroBead Kit, mouse. Cells were fluorescently stained with the Anti-ACSA-2 antibody and analyzed by flow cytometry on the MACSQuant Analyzer. Successful cultivation of adult astrocytes. Adult astrocytes were isolated from brain of 9-week-old mice using the Anti-ACSA-2 MicroBead Kit, and were cultured in MACS Neuro Medium, MACS NeuroBrew-21, 1%P/S and 0.5mM L-glutamine on PLL and laminin-coated glass bottom plates (10 µg/mL). After 7 days culture, cells were fixed and stained with the astrocyte-specific antibodies Anti-GLAST (green) and Anti-GFAP (red). Successful cultivation of adult astrocytes. Adult astrocytes were isolated from brain of 9-week-old mice using the Anti-ACSA-2 MicroBead Kit, and were cultured in MACS Neuro Medium, MACS NeuroBrew-21, 1%P/S and 0.5mM L-glutamine on PLL and laminin-coated glass bottom plates (10 µg/mL). After 7 days culture, cells were fixed and stained with the astrocyte-specific antibodies Anti-GLAST (green) and Anti-GFAP (red). Miltenyi Biotec offers a range of MicroBeads and kits for the isolation of oligodendrocyte lineage cells. The Anti-A2B5 MicroBeads, human, mouse, rat enable selection of glial progenitor cells, whereas the CD140a (PDGFRα) Microbead Kit and the Anti-AN2 (NG2) MicroBeads serve to isolate oligodendrocyte precursors. Isolation of oligodendrocyte precursor cells from neonatal mouse brain. P2 whole mouse brains were dissociated using the Neural Tissue Dissociation Kit (P). Subsequently, oligodendrocytes were isolated using the CD140a (PDGFRα) MicroBead Kit, mouse. Cells were fluorescently stained with the CD140a antibody, and analyzed on the MACSQuant Analyzer. Isolation of oligodendrocyte precursor cells from neonatal mouse brain. P2 whole mouse brains were dissociated using the Neural Tissue Dissociation Kit (P). Subsequently, oligodendrocytes were isolated using the CD140a (PDGFRα) MicroBead Kit, mouse. Cells were fluorescently stained with the CD140a antibody, and analyzed on the MACSQuant Analyzer. Successful cultivation of oligodendrocytes. CD140a-positive oligodendrocytes were cultured in MACS NeuroMedium, MACS NeuroBrew-21, 1%P/S , 0.5mM L-glutamine, 10ng/mL PDGF-AA and 10ng/mL FGF-2 on PLL-coated glass coverslips (5x104 cells per well of 24-well plate). After 7 days in culture, cells were fixed and stained with the oligodendrocyte-specific antibodies Anti-MBP (red) and Anti-AN2 (green); blue stain is DAPI. CD140a-positive oligodendrocytes were cultured in MACS NeuroMedium, MACS NeuroBrew-21, 1%P/S , 0.5mM L-glutamine, 10ng/mL PDGF-AA and 10ng/mL FGF-2 on PLL-coated glass coverslips (5x104 cells per well of 24-well plate). After 7 days in culture, cells were fixed and stained with the oligodendrocyte-specific antibodies Anti-MBP (red) and Anti-AN2 (green); blue stain is DAPI. Premature oligodendrocytes can be isolated from neonatal and adult brain tissue with the Anti-O4 MicroBeads, human, mouse, rat. Neonatal and adult oligodendrocytes isolated with the Anti-O4 MicroBeads. 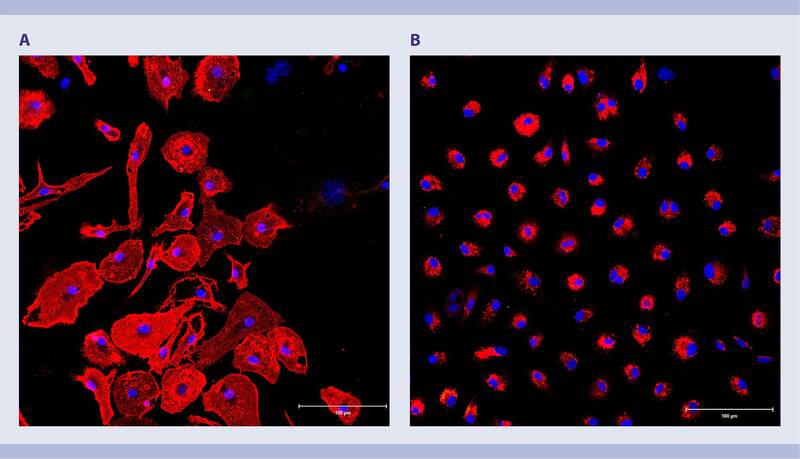 Cells were fluorescently stained with the Anti-O4 antibody, and analyzed with the MACSQuant Analyzer. Neonatal and adult oligodendrocytes isolated with the Anti-O4 MicroBeads. Cells were fluorescently stained with the Anti-O4 antibody, and analyzed with the MACSQuant Analyzer. Highly purified (99%) and viable microglial cells can be separated from both neonatal and adult mouse or rat brain tissue with CD11b (Microglia) MicroBeads, human and mouse or CD11b/c (Microglia) MicroBeads, rat. In combination with the MultiMACS™ Cell24 Separator Plus or autoMACS Pro Separator, these kits enable fast, high-quality microglial cell isolation from up to 24 samples in parallel. Isolation and characterization of microglia from neonatal and adult mouse brain. Single-cell suspensions were prepared from either P1 mouse brain using the Neural Tissue Dissociation Kit (P) (A) or from 2-month-old mouse brain using the Adult Brain Dissociation Kit, mouse and rat (B). Microglia were isolated from the single-cell suspension using CD11b (Microglia) MicroBeads, human and mouse through two MS columns. 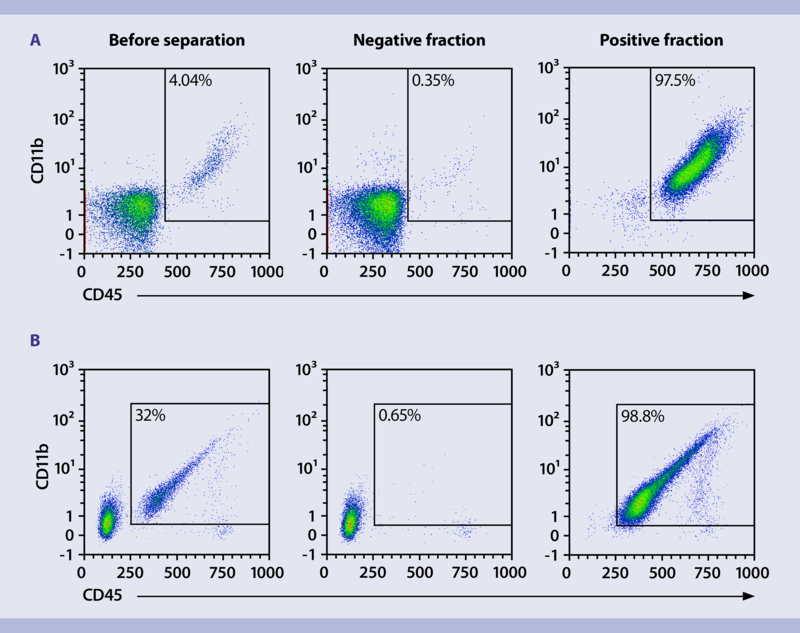 Cells were fluorescently stained with CD11b and CD45 antibodies, and analyzed by flow cytometry using the MACSQuant Analyzer. Isolation and characterization of microglia from neonatal and adult mouse brain. Single-cell suspensions were prepared from either P1 mouse brain using the Neural Tissue Dissociation Kit (P) (A) or from 2-month-old mouse brain using the Adult Brain Dissociation Kit, mouse and rat (B). Microglia were isolated from the single-cell suspension using CD11b (Microglia) MicroBeads, human and mouse through two MS columns. Cells were fluorescently stained with CD11b and CD45 antibodies, and analyzed by flow cytometry using the MACSQuant Analyzer. High purity of microglia population isolated with the CD11b MicroBeads, human and mouse. Adult whole mouse brains were dissociated. Subsequently, microglia were isolated using the CD11b MicroBeads. Microglia were cultured in DMEM, 10% FCS, 1%P/S and 2mM L-glutamine on PLL-coated glass coverslips (1x105 cells per well of a 24-well plate) for 7 days. Cells were fixed and stained with the microglia-specific antibodies CD11b (A); red) and CD68 (B; red). Blue stain is DAPI. High purity of microglia population isolated with the CD11b MicroBeads, human and mouse. Adult whole mouse brains were dissociated. Subsequently, microglia were isolated using the CD11b MicroBeads. Microglia were cultured in DMEM, 10% FCS, 1%P/S and 2mM L-glutamine on PLL-coated glass coverslips (1x105 cells per well of a 24-well plate) for 7 days. Cells were fixed and stained with the microglia-specific antibodies CD11b (A); red) and CD68 (B; red). Blue stain is DAPI. Highly purified endothelial cells can be acquired from both neonatal or adult mouse brain by first depleting non-target cells with CD45 MicroBeads, mouse, and then selecting endothelial cells using the CD31-Microbeads, mouse. High-purity endothelial cell population from neonatal mouse brain. P2 whole mouse brains were dissociated using the Neural Tissue Dissociation Kit (P). Endothelial cells were isolated by depletion of CD45-positive cells and subsequent selection of CD31-positive cells using CD45 MicroBeads and CD31 MicroBead Kit, respectively. Cells were fluorescently stained with the CD31 and CD45 antibodies, and analyzed with the MACSQuant Analyzer. High-purity endothelial cell population from neonatal mouse brain. P2 whole mouse brains were dissociated using the Neural Tissue Dissociation Kit (P). Endothelial cells were isolated by depletion of CD45-positive cells and subsequent selection of CD31-positive cells using CD45 MicroBeads and CD31 MicroBead Kit, respectively. Cells were fluorescently stained with the CD31 and CD45 antibodies, and analyzed with the MACSQuant Analyzer. 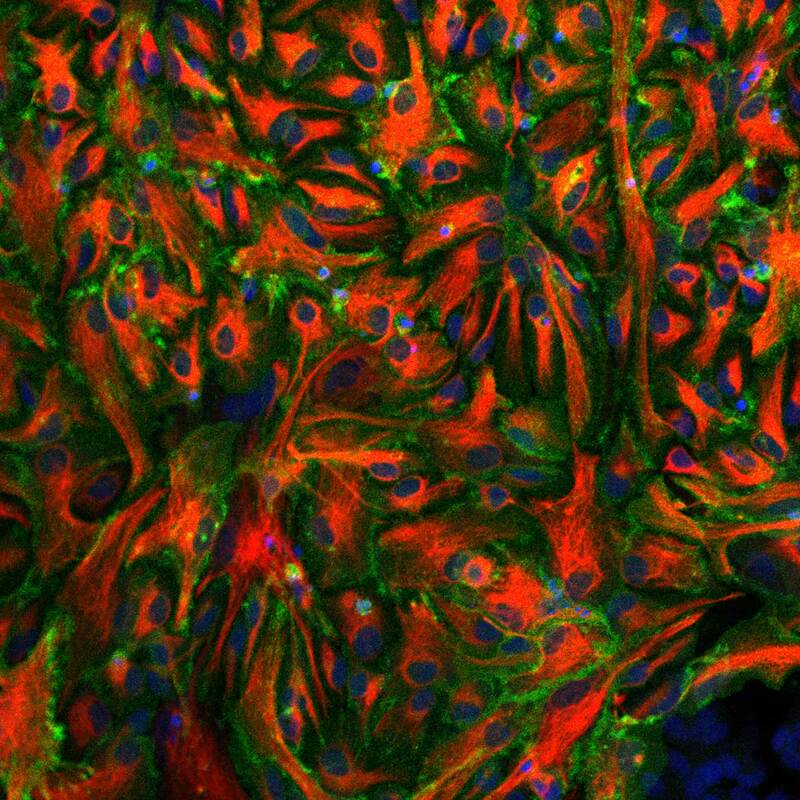 Nearly confluent population of cultured endothelial cells. 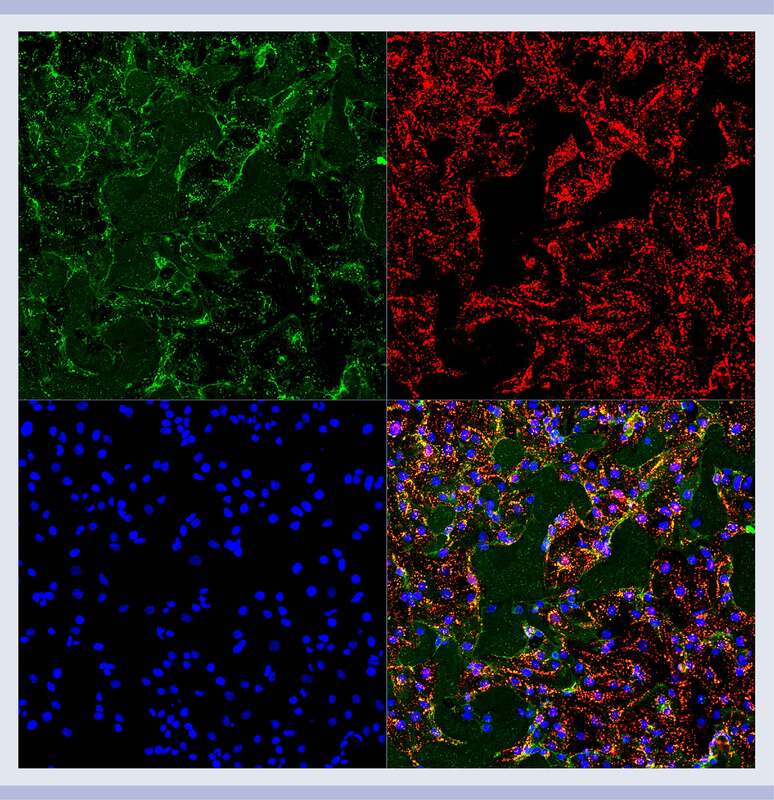 CD31-positive endothelial cells were cultured in EBM-2 basal medium plus all supplements on fibronectin-coated glass coverslips. After 2 days culture, cells were fixed and stained with the endothelial cell-specific markers CD31 (green) and DIL-AC-LDL (red). Nearly confluent population of cultured endothelial cells. CD31-positive endothelial cells were cultured in EBM-2 basal medium plus all supplements on fibronectin-coated glass coverslips. After 2 days culture, cells were fixed and stained with the endothelial cell-specific markers CD31 (green) and DIL-AC-LDL (red). Efficient isolation of adult endothelial cells from brain tissue. Adult mouse brains were dissociated using the Adult Brain Dissociation Kit, mouse and rat. Endothelial cells were isolated by depletion of CD45-positive cells and selection of CD31-positive cells using the CD45 MicroBeads and the CD31 MicroBeads, respectively. Cells were fluorescently stained with the CD31 and CD45 antibodies, and analyzed with the MACSQuant Analyzer. Efficient isolation of adult endothelial cells from brain tissue. Adult mouse brains were dissociated using the Adult Brain Dissociation Kit, mouse and rat. Endothelial cells were isolated by depletion of CD45-positive cells and selection of CD31-positive cells using the CD45 MicroBeads and the CD31 MicroBeads, respectively. Cells were fluorescently stained with the CD31 and CD45 antibodies, and analyzed with the MACSQuant Analyzer. Successful cultivation of endothelial cells from adult mouse brain tissue. CD31-positive endothelial cells were cultured in EBM-2 basal medium plus all supplements on fibronectin-coated glass coverslips. After 2 days in culture, cells were fixed and stained with DAPI (blue), and the endothelial cell-specific markers CD31 (green) and DIL-AC-LDL (red). Successful cultivation of endothelial cells from adult mouse brain tissue. CD31-positive endothelial cells were cultured in EBM-2 basal medium plus all supplements on fibronectin-coated glass coverslips. After 2 days in culture, cells were fixed and stained with DAPI (blue), and the endothelial cell-specific markers CD31 (green) and DIL-AC-LDL (red). Miltenyi Biotec offers a broad range of validated cell-specific surface markers for flow cytometry that enable testing the purity of isolated cells, quantification of cell populations and the examination of overlapping markers. Analysis of the oligodendrodyte cell lineage is a good example of the discriminatory power of this characterization method. A2B5 expression decreases with animal age as oligodendrocytes mature. 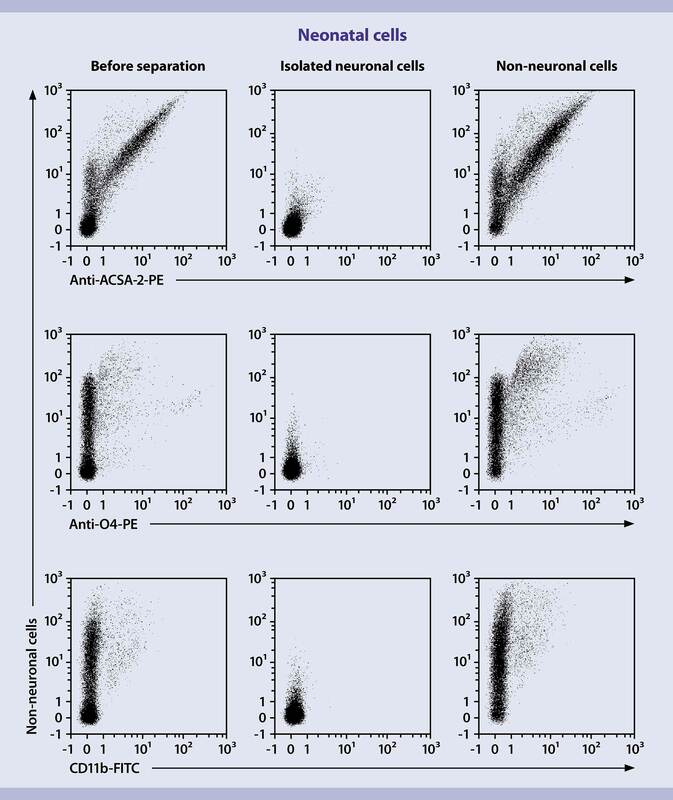 Flow cytometry analysis using Anti-AN2 and Anti-A2B5 monoclonal antibodies show changes in expression and enable quantification of oligodendrocyte and glial precursor cells. Decreasing A2B5 expression in oligodendrocytes with mouse age. Cells from P1 (A), P3 (B), and P7 (C) mouse cortex were stained with Anti-AN2-PE and Anti-A2B5-APC. AN2+ cells are in the two upper quadrants, while A2B5+ cells are in the two right quadrants. The percentage of cells that are positive for both markers is shown in the upper right quadrant. The dot plots show a significant decrease of A2B5+ cells with increasing animal age, so that the overlap with AN2 disappears. Decreasing A2B5 expression in oligodendrocytes with mouse age. Cells from P1 (A), P3 (B), and P7 (C) mouse cortex were stained with Anti-AN2-PE and Anti-A2B5-APC. AN2+ cells are in the two upper quadrants, while A2B5+ cells are in the two right quadrants. The percentage of cells that are positive for both markers is shown in the upper right quadrant. The dot plots show a significant decrease of A2B5+ cells with increasing animal age, so that the overlap with AN2 disappears. Cultivation of primary neurons and glial cells is widely used to study brain function in a controlled in vitro environment. This is a powerful tool to understand the molecular and cellular mechanisms of neural cell dysfunction and death in neurodegenerative diseases, to study the individual contribution of different cell types to disease progression, and to investigate the interactions between neural cells during development and diseases. MACS Neuro Medium supplemented with the serum-free MACS NeuroBrew®-21 are optimized to support growth and long-term survival of mouse neonatal and adult neurons, astrocytes, and oligodendrocytes. To maintain undifferentiated neural stem or precursor cells, MACS NeuroBrew-21 is also available without vitamin A (MACS NeuroBrew-21 w/o Vitamin A). Highly-pure neuron populations in culture. Neurons isolated from P1 mouse cerebral hemispheres (A, B) were cultured in MACS Neuro Medium, MACS NeuroBrew-21, 1% P/S and 0.5 mM L-glutamine on PLL-coated glass coverslips. After 2 days (neonatal, A) and 6 days (neonatal, B) in culture, neurons from neonatal brain tissue were fixed and stained with the neuron-specific antibody Anti-MAP2 (red) and the astrocyte-specific antibody Anti-GLAST (green), showing that the culture contains no contaminating astrocytes. Highly-pure neuron populations in culture. Neurons isolated from P1 mouse cerebral hemispheres (A, B) were cultured in MACS Neuro Medium, MACS NeuroBrew-21, 1% P/S and 0.5 mM L-glutamine on PLL-coated glass coverslips. After 2 days (neonatal, A) and 6 days (neonatal, B) in culture, neurons from neonatal brain tissue were fixed and stained with the neuron-specific antibody Anti-MAP2 (red) and the astrocyte-specific antibody Anti-GLAST (green), showing that the culture contains no contaminating astrocytes. Cultivation of isolated oligodendrocytes. Oligodendrocytes were isolated from adult whole mouse brains using the Anti-O4 MicroBeads. O4-positive oligodendrocytes were cultured in MACS Neuro Medium, MACS NeuroBrew-21, 1% P/S and 0.5 mM L-glutamine (+PDGF-AA/FGF-2) on PLL-coated glass coverslips. After 5 days culture, cells were fixed and stained with the oligodendrocyte-specific antibodies Anti-MOG (green) Anti-PLP (red). Oligodendrocytes were isolated from adult whole mouse brains using the Anti-O4 MicroBeads. O4-positive oligodendrocytes were cultured in MACS Neuro Medium, MACS NeuroBrew-21, 1% P/S and 0.5 mM L-glutamine (+PDGF-AA/FGF-2) on PLL-coated glass coverslips. After 5 days culture, cells were fixed and stained with the oligodendrocyte-specific antibodies Anti-MOG (green) Anti-PLP (red). Cultivation of isolated oligodendrocytes. Oligodendrocytes were isolated from neonatal whole mouse brains using the Anti-O4 MicroBeads. O4-positive oligodendrocytes were cultured in MACS Neuro Medium, MACS NeuroBrew-21, 1% P/S and 0.5 mM L-glutamine (+PDGF-AA/FGF-2) on PLL-coated glass coverslips. After 5 days culture, cells were fixed and stained with the oligodendrocyte-specific antibodies Anti-MBP (green). Oligodendrocytes were isolated from neonatal whole mouse brains using the Anti-O4 MicroBeads. O4-positive oligodendrocytes were cultured in MACS Neuro Medium, MACS NeuroBrew-21, 1% P/S and 0.5 mM L-glutamine (+PDGF-AA/FGF-2) on PLL-coated glass coverslips. After 5 days culture, cells were fixed and stained with the oligodendrocyte-specific antibodies Anti-MBP (green). 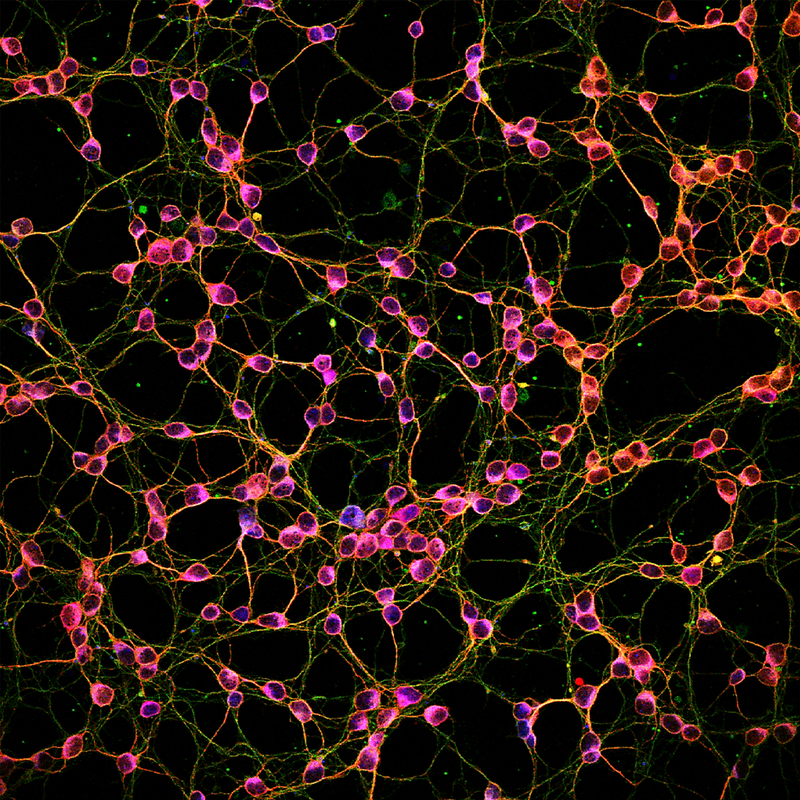 Our new serum-free AstroMACS Medium supports superior neonatal astrocyte growth even with very low seeding densities, and enhanced adult astrocyte culture, especially when the new AstroMACS Separation Buffer is used during cell separation to remove dead cells and provide a healthy culture environment. Superior astrocyte growth even with low seeding densities. Neonatal astrocytes were isolated from P4 mice using the Neural Tissue Dissociation Kit (P) and the Anti-ACSA-2 MicroBead Kit. Cells were cultured in MACS Neuro Medium and MACS NeuroBrew-21, or in AstroMACS Medium at different densities in a 24-well imaging plate for 7 days. Cells were fixed and stained with Anti-GLAST antibody (yellow) and DAPI (blue), and dead and viable astrocytes were analyzed with the Cytation™ Cell Imaging Multi-Mode Reader. (A) Microscopy images of one representative well. (B) Quantitative data of 4 replicates. Superior astrocyte growth even with low seeding densities. Neonatal astrocytes were isolated from P4 mice using the Neural Tissue Dissociation Kit (P) and the Anti-ACSA-2 MicroBead Kit. Cells were cultured in MACS Neuro Medium and MACS NeuroBrew-21, or in AstroMACS Medium at different densities in a 24-well imaging plate for 7 days. Cells were fixed and stained with Anti-GLAST antibody (yellow) and DAPI (blue), and dead and viable astrocytes were analyzed with the Cytation™ Cell Imaging Multi-Mode Reader. (A) Microscopy images of one representative well. (B) Quantitative data of 4 replicates. Superior astrocyte growth even with low seeding densities. Confocal image of neonatal astrocytes cultured in AstroMACS Medium and stained with Anti-GLAST antibody (green) and DAPI (blue). 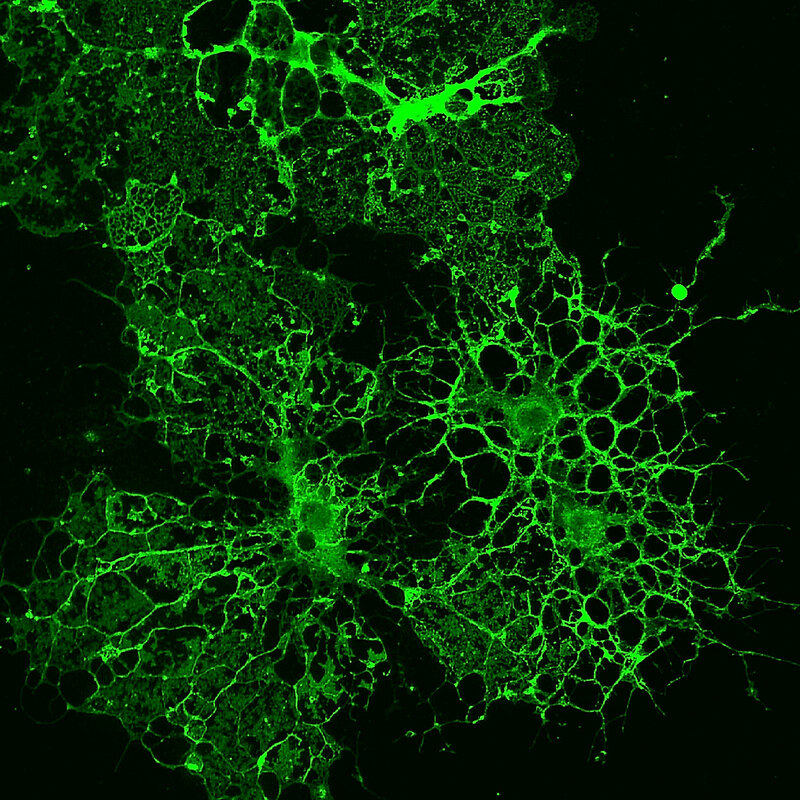 Confocal image of neonatal astrocytes cultured in AstroMACS Medium and stained with Anti-GLAST antibody (green) and DAPI (blue). Enhanced adult cell culture through removal of dead cells. 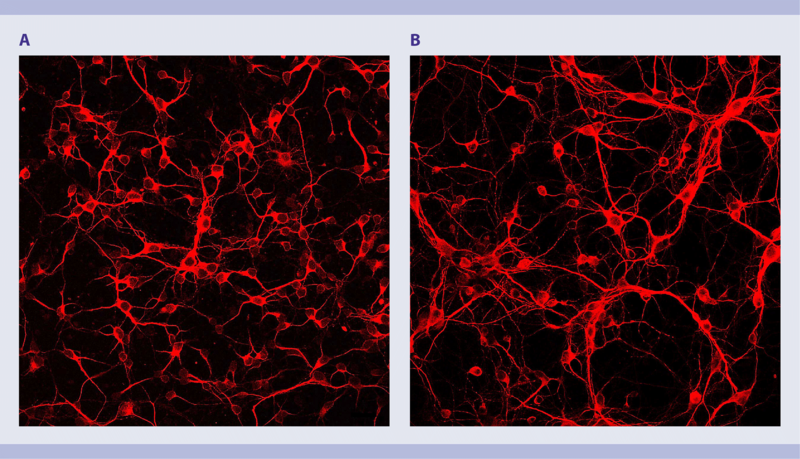 Adult astrocytes were isolated from the brain of 8-week-old mice using the Adult Brain Dissociation Kit and the Anti-ACSA-2 MicroBead Kit with (A) or without (B) the AstroMACS Separation Buffer. Cells were cultivated in AstroMACS Medium at a density of 100,000 cells /well in a 24-well Imaging Plate for 7 days. Cells were fixed and stained with Anti-GLAST antibody (green) and DAPI (blue). Enhanced adult cell culture through removal of dead cells. 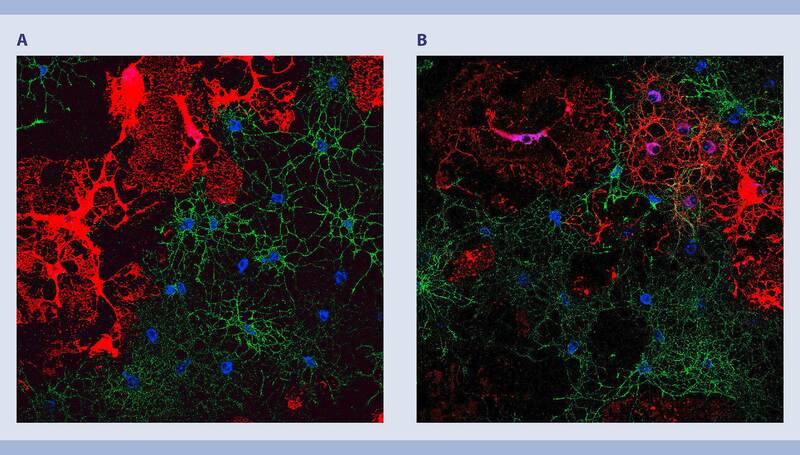 Adult astrocytes were isolated from the brain of 8-week-old mice using the Adult Brain Dissociation Kit and the Anti-ACSA-2 MicroBead Kit with (A) or without (B) the AstroMACS Separation Buffer. Cells were cultivated in AstroMACS Medium at a density of 100,000 cells /well in a 24-well Imaging Plate for 7 days. Cells were fixed and stained with Anti-GLAST antibody (green) and DAPI (blue). For more information about Miltenyi Biotec media optimized for neural cells, see chapter Cell culture. Miltenyi Biotec offers an extensive portfolio of cytokines for neural cell differentiation and maintenance, including human BDNF, CTNF, EGF, FGF-2, and GDNF, that can be purchased in premium, research or GMP grade. Immunohistochemistry (IHC) or immunocytochemistry (ICC) techniques have contributed immensely to the advancement of neuroscience. By staining cells with highly specific colored probes, scientists can visualize brain tissue structure, cellular organization, and molecular and cellular architecture in high-resolution colored images. A key element for a successful IHC or ICC staining are antibodies that bind with great specificity to the antigen of interest. This specificity enables using probes to distinguish between neurons, astrocytes, oligodendrocytes and more, as well as assess purity of isolations and cell cultures. 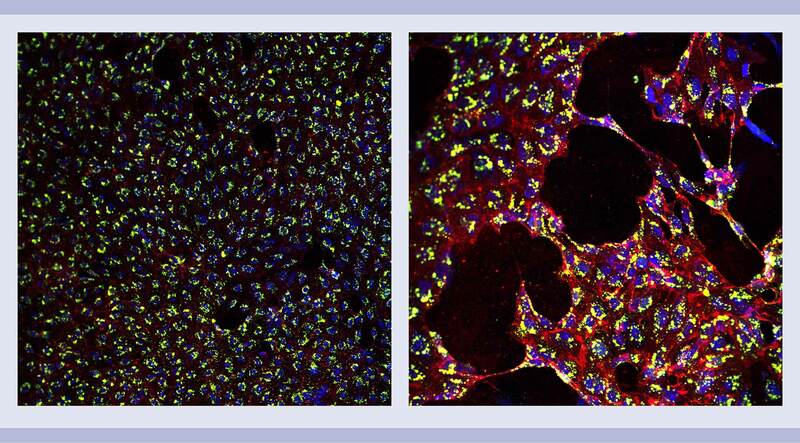 Both polyclonal or monoclonal antibodies can be used for ICC or IHC. However, monoclonal antibodies are preferred, due to their higher specificity, purity, consistency, and lower background. Miltenyi Biotec has developed monoclonal antibodies for specific immunofluorescent staining of cultivated adherent neural cells or PFA-fixed tissue cryosections.